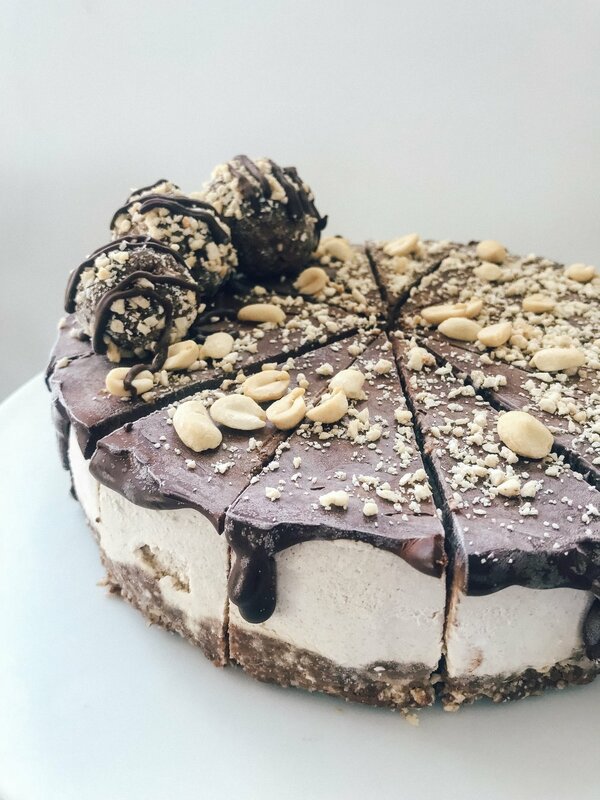 I've been wanting to attempt a raw / vegan cheesecake for ages. Whenever I have them out somewhere I always think they taste incredible, but for some reason they intimidated me. Lets break it down though. Really, all we have here is a base (all in the blender), filling and a simple ganache on top, not dissimilar to all the other slices I make. With friends coming over tonight it was the perfect excuse. The hardest part was actually deciding on flavour - next time I will go for blueberry, but for my first try I decided on Peanut Butter using my fave PB from Pics. I spotted this recipe on Julia & Libby's website a while back, all I did was make a few adjustments with the topping, opting for a chocolate ganache layer on top. I also made some peanut butter and cacao bliss balls to go on top, which I will post the recipe for tomorrow. 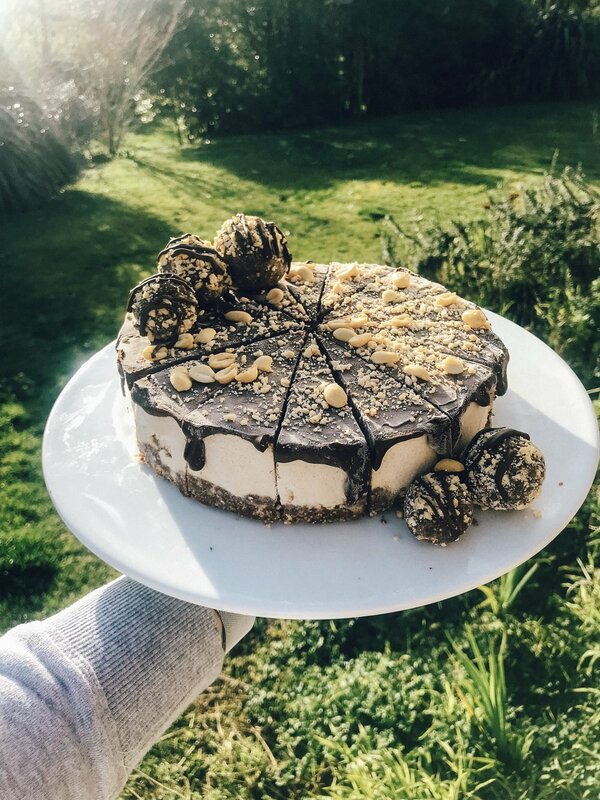 It gets all the ticks from me - it's refined sugar free, choc full of protein with all of those nuts, it's vegan (completely dairy free) and gluten free. So lets do this! Honestly, it was easy and it's SO SO decadent and delicious, perfect for a special occasion or slicing and popping in the freezer to eat piece by piece! 8 medjool dates, pitted and soaked for half an hour in warm water. Line spring form tin with baking paper. Place all crust ingredients into food processor and pulse until grainy-mixed texture. Press crust down into cake pan evenly and place into the freezer. Place all cheesecake ingredients into food processor and blend until smooth and creamy. Spread evenly on top of base using a knife or spatula. Place in the freezer for 3 or more hours. Pour your ganache over top of the frozen cheesecake. I used a squezzy bottle but you can do this however you like. Cake is best stored in the freezer.